Whether it's a tweed jacket or a brick patio, the herringbone pattern is all over the place. 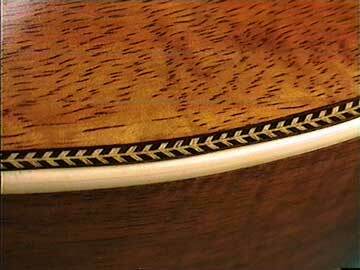 It's so synonymous with the Martin guitar design that some folks think Martin invented the pattern. Martin is an old company but they came along a few thousand years too late for that one! You just can't beat a classic like this one! And, yes, it does look a little like a fish skeleton. . . The pre-World War II Martin D-28 is so popular and desirable, it has become known in Bluegrass circles simply as a "herringbone," or even just a "bone."